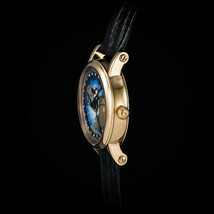 Christiaan Van Der Klaauw "Mondial CK-3" 18K Rose Gold Gent's Astronomical Complication. Unique Piece with Hand Engraving by Jochen Benzinger. 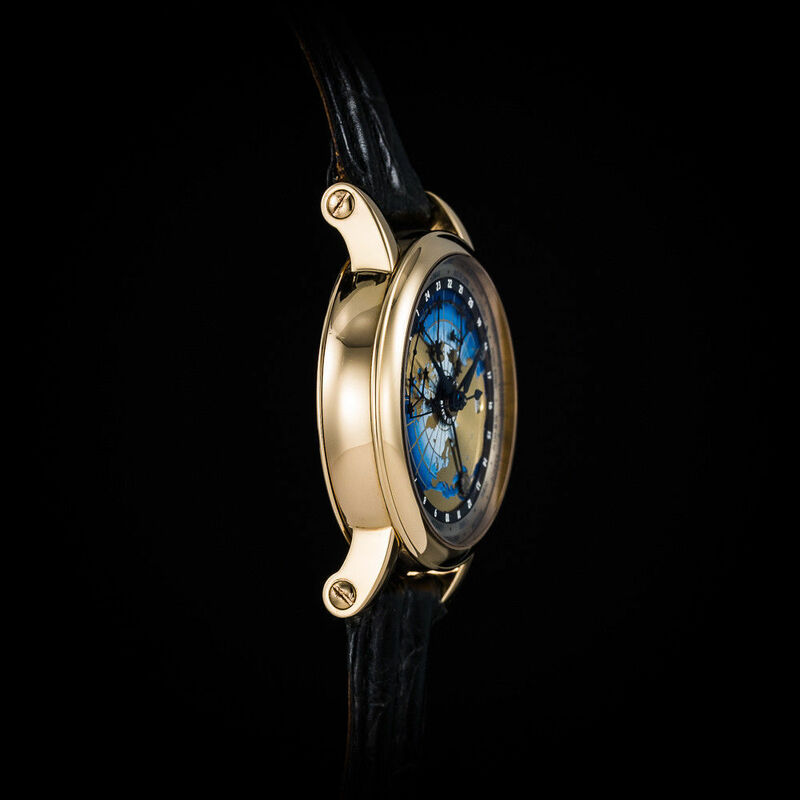 Special Edition Features the unique dial with a photocopy of a letter from Christiann Van Der Klauw All Sold Out. Extremely Rare. 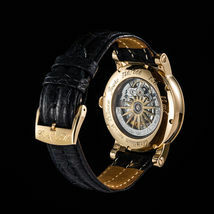 The "Mondial" is one the most collectible independent high horology pieces ever, and the rarest of all of CvdK models. World wide production of 27 pieces total. If you are looking at this, then you are true connoisseur, this piece is a true collector's dream. In mint, like new condition, carefully owned by a collector and worn for a handful of times to special events. Comes with original Van Der Klaauw ose gold buckle. Comes with aftermarket strap. Comes with original box, photocopies of the instructin (Sorry but original copies are misplaced) and a copy of a letter from CvdK stating the origin of the watch (which is reproduced below in the description) Dial: Beautiful blue lacquered dial with gilded sundial (unique), Dimension: Measure 40mm without crown. 42mm with crown. Weighs a solid 120 grams. Exactly as shown in photos. We only use photos of the actual watch Sell for over 50,000 on the secondary market. This is an Unique Piece with a special dial, with a letter from CVDK. 100% Authentic or MONEY BACK GUARANTEED!! Features world time. moonphase, and local times. Included are the original CvdK box, photo copies of the instruction, as well as a copy of personal letter pertaining to the origin of this EXACT piece. (The copy of the letter will be sent with the watch) "The Mondial is made since 2005 and three different designs have been produced. 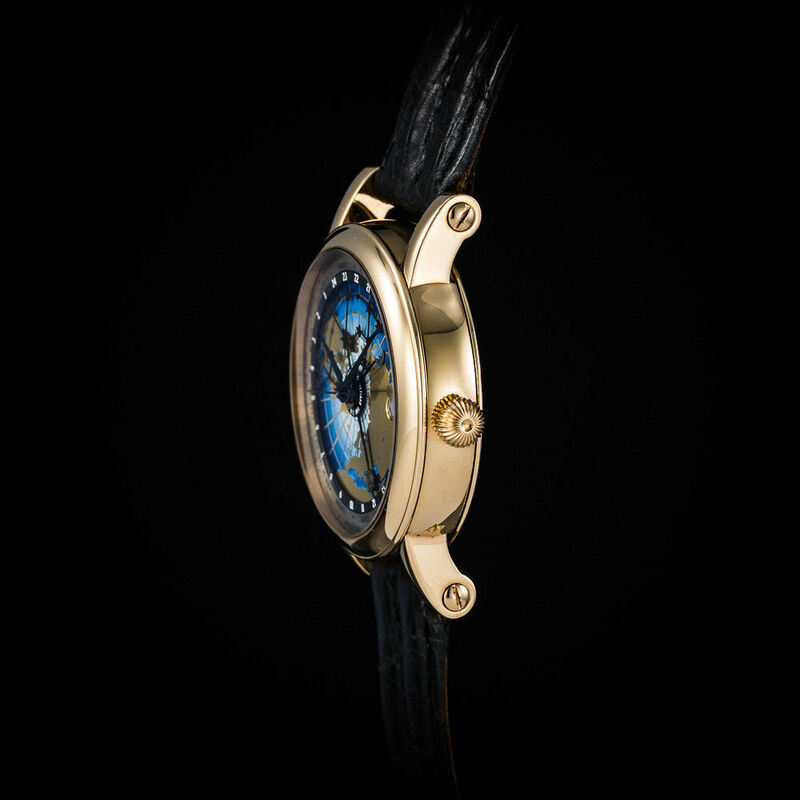 In the beginning, the Mondial was fitted with a rotating earth disc and overlapping dial. This version was just called “Mondial” (without addition) and 7 pieces were made. Then we introduced a model with solid earth disk, the Mondial Ck-2. This watch had a sundial with stars and a moon pointer besides the regular pointers. 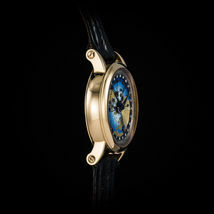 This model has been made in several variations because the dial is unique due to the application of airbrush, initially a gilded sun hand was used, later a blown steel pointer. The Mondial CK-2 has been estimated to be 15 [pieces] In 2008, the Mondial received a technical improvement, which enabled the condition of the sun to be more adjustable. This model, for convenience, received the addition Ck-3, and so far 5 of them have been sold. In total, the Mondial made about 27 pieces. So you have an ultra-exclusive watch watch. However, your watch is unique. 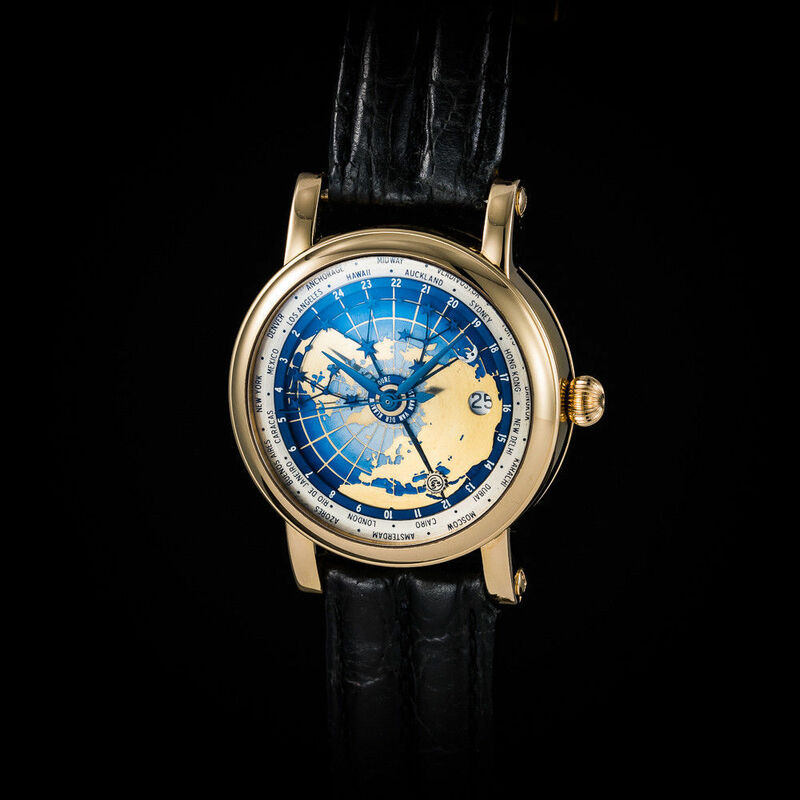 Technically speaking, your Mondial is a Ck-3, but the only one in this version that features a gilded sundial.” Instruction: After passing midnight, when the date change, you can notice that the map of Europe is under a star chart (12am), which means that it is the night in that particular globe area, while, at the opposite, the sun is pointing Hawaii. In fact, at Hawaii is at noon (12pm) and the sun is at its zenith. As the hands are making a complete turn in 12h, the night and day indication is rotating two times slower (one complete turn in 24H). Concentric to this indication and moving clockwise also, the moon hand in combinaison with the sun/stars hand indicates the moon phases. If the sun and the moon hands are perfectly opposite of each other, it is full moon. Whereas, if they are superimposed, it means a new moon. In order to set the correct moon phase indication with the calendar, one can make a quick adjustment of the date at 3 with the winding crown. The moon moves slower than the sun, because its total rotation is done in 29.5 days. Shipping: Free shipping within the U.S. International shipping is 195. It includes full insurance, which can be a bit high given the high value of it. I am only quoting the actual shipping price and never make money on the shipping. Thank you very much for your understanding! Payment Methods: I can take paypal(confirmed and verified address only) and can contact the winner bidder for other payment details and other payment alternatives for the winner's convenience. I have 100% positive feedbacks , have sold tons of high value fine watches,so please buy with confidence! I DO NOT ACCEPT ANY KIND OF ESCROW SERVICE. Please only bid when you plan to pay. Thanks for your cooperation! For your safety: To protect you from fraudulent solicitors, I have made this sale private so your identities are not exposed to harm.